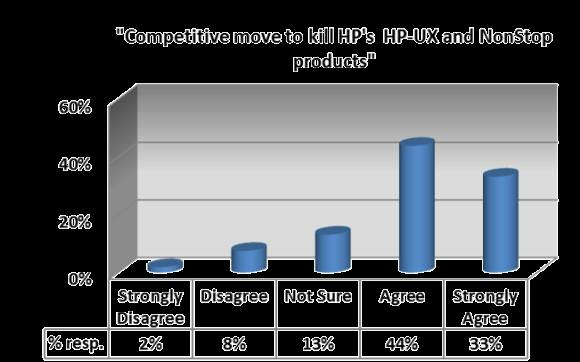 A massive 77% of survey respondents say Oracle dropped development support of Itanium to kill HP's Itanium server product lines. The rationale: If Oracle software isn't available on these systems, the workloads would naturally migrate to Oracle's Solaris Unix variant. This isn't unprecedented. In the '90s, several Unix vendors gave up on the business when Oracle either withdrew support or made them second-tier ports. However, it's a vastly different world today, and customers have many more options.